This section will hopefully grow to become one of the biggest “How to…” guides on the web. Check back frequently to see the newest updates and “How to…” guides, use the links below to get to the section you are interested in. Add Blank Space to iPhone Home Screen. Connect wireless keyboard to Mac. 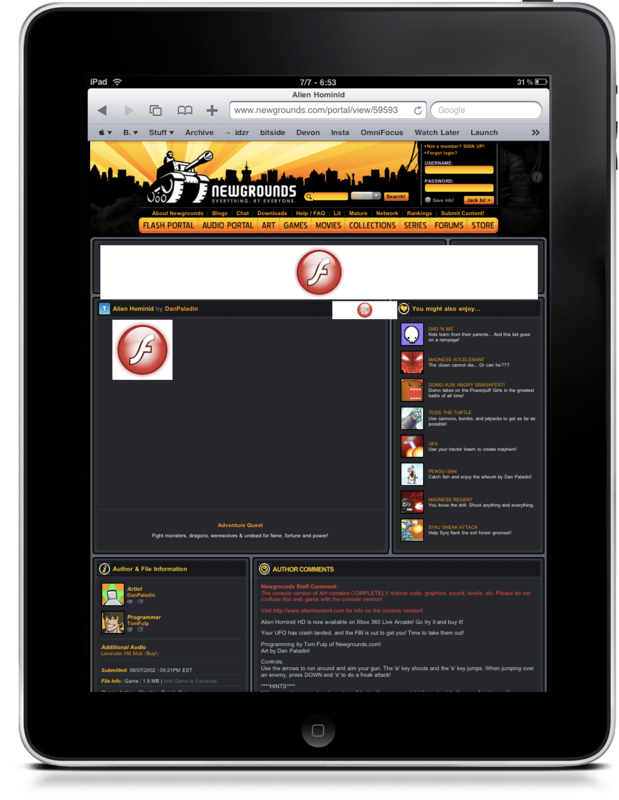 As you might remember we recently posted an article about flash for the iPad. Now, Engadget has the download link to the first version of Frash (0.01) which allows you to play games and other Flash content on your jailbroken iPad, unfortunately however it currently doesn’t support video playback. According to sources however the developers are currently working on a future release. If you are interested in installing Frash on the iPad then here is a quick guide. Step 1)Once you’ve downloaded Frash, open the Media folder in /var/root. Go create one if it’s not there. Step 2) Inside Media, create a Cydia folder. Inside Cydia, create an AutoInstall folder. Step 3) Copy the .deb file in there. 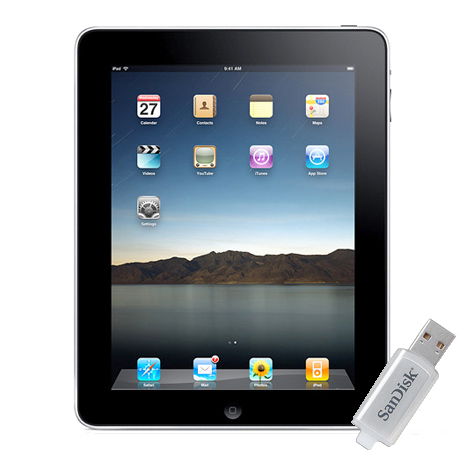 Watch out – you don’t want to screw up your iPad file system. Don’t mess with system folders and files you don’t know. Step 4)Once you’ve uploaded Frash, reboot your iPad. You can easily do this using SBSettings, which you can download from Cydia. Step 5)Once the iPad is rebooted, go open a page with some Flash content on it (but again, no video yet). The F? means that flash is running on your iPad. 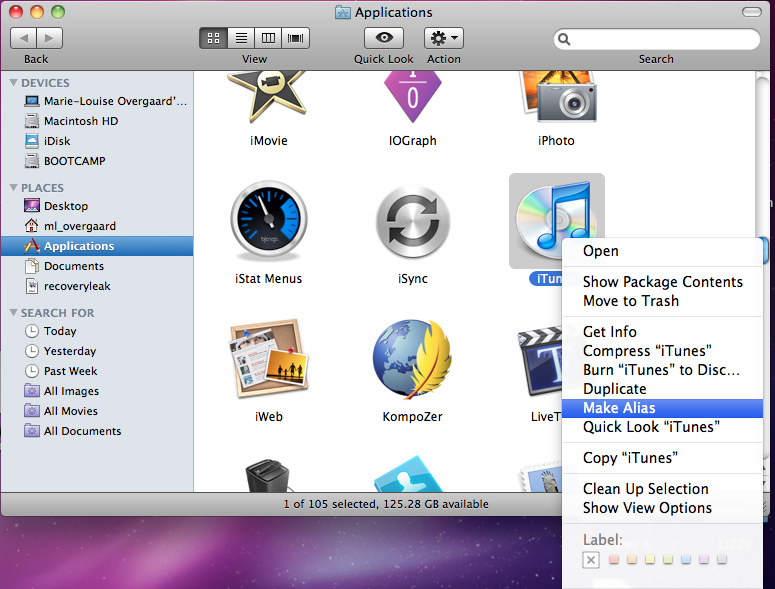 Step 6)To enable it (pretty much like ClickToFlash on Mac OS X) tap on it and Flash will load. Audio and video are in there, controls are pretty smooth and stable even though it’s a first release. Of course as always we will keep you posted up to date on future updates with video playback support. 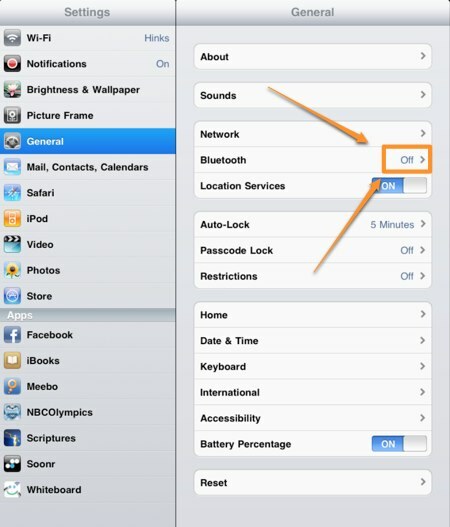 How to connect Your iPad to Wireless Keyboards. One of the reasons why I love using the iPad is the fact that you can connect to and use Bluetooth devices, such as keyboards and mice. While the iPad does come with a built in keyboard that shows up on the screen as you enter input fields, however sometimes it is just nicer to use the more traditional keyboard, especially if you are writing longer texts, or need to get work done quickly. Therefore we think that if you really want to rely on the iPad for productivity then it would be a good idea to know how to connect an iPad to bluetooth keyboards. Step 3)Slide the Off button on the Bluetooth setting to ON. This will tell the iPad to start looking for devices it can connect to. To test if you did everything correctly simply open the app you need to type quickly on and start typing away on your iPads bluetooth keyboard. Step 2) Simply find the song that you want to make into a ringtone. Listen to the song and find the part of it you want to use. Type in the start time of your ringtone in the text box next to “Start Time” in the minutes:seconds (i.e., 2:01) format. Step 8 ) Type in the end time of your ringtone in the text box next to “Stop Time.” Make sure the ringtone is no more than 40 seconds long. Right-click your song again and select “Convert Selection to AAC.” Wait for iTunes to convert your song. It will create a duplicate version. Click on the “Keep Files” button. Find the file. It’s usually in your User folder under “Music > iTunes > iTunes Music” and under the band’s name. It will have an extension of m4a. Step 15) Double click to open the ringtone file you just renamed. iTunes will automatically add this new ringtone to the Ringtones folder within the application. Step 16) Finally, connect your iPhone and sync your new ringtone! You can then select it as any other iPhone ringtone via your iPhone settings. Add PDF files to iTunes for syncing with iBooks. If you have tried adding PDF files to iTunes for syncing with iBooks on your iPad, iPhone or iPod Touch then you will know that this isn’t as easy as it sounds. However here is a method which should make it easier for you to send any document or even web page straight to the Books section of iTunes for syncing with ease. 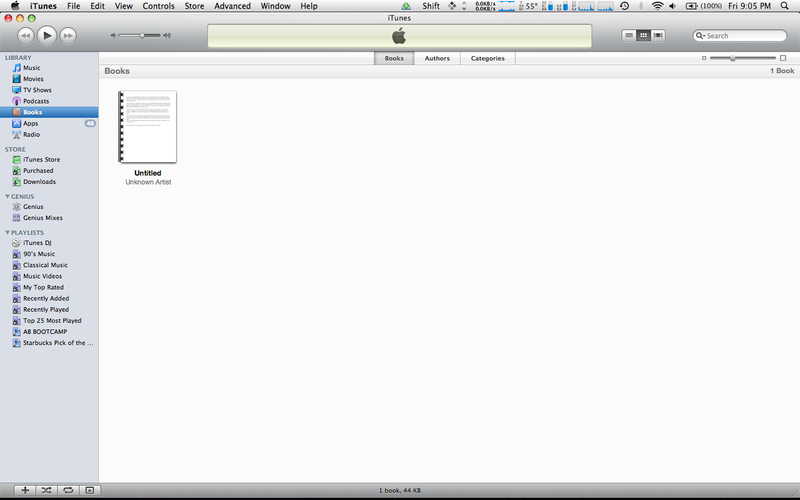 To get iTunes ready is simple. All you have to do is open your Applications folder, and make an alias of iTunes by control-clicking its icon and selecting ‘Make Alias’. Now drag your newly-created alias and drop it in [Your Home folder] → Library → PDF Services. What this does is adds iTunes as an option when you select the PDF button in a Print dialog. If you did everything correct, then when you click the PDF button under Print, it’s going to say ‘iTunes alias’, which isn’t very informative. So the last thing you will want to do is rename the iTunes alias in the Finder to something along the lines of ‘Send PDF to iTunes’ or ‘Add PDF to iTunes’ and the menu item in the Print dialog should update next time you open it. Now whenever you have a document or web page open that you’d like to read in iBooks, all you have to do is go to File → Print, then click the PDF button in the lower left and choose your menu item for iTunes. The document will be saved as a PDF and sent straight into the Books section of your iTunes library. To test if it was really added to your Book section, just open iTunes, and check if it was added. When you have both of the above, then this is what you need to do in order to import photos and videos onto your iPad. 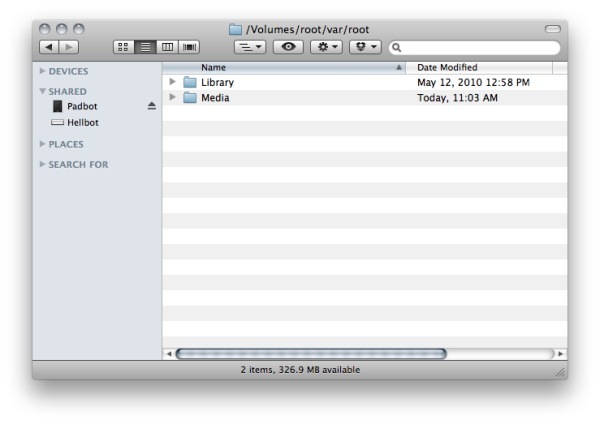 1. take the thumb drive and create a folder on it named DCIM. 2. Next, copy the photos and video you want to import into the Photos app on your iPad into that particular folder. 3. Finally, plug the USB thumb drive into the Connection Kit. If you do this correctly The iPad will recognize the thumb drive as if it were a camera and import the photos and videos. Many users want to keep the home screen free from icons other than then ones Apple pre-installed on the phone, right now you can just move you icons around, however the next time you download a new app these are automatically installed on the blank spots. So how do you prevent this from happening? This all-black icon can hold a place on your home screen. 1.When you loaded the site simply press the plus sign. 2.In the pop-up menu, select Add to Home Screen, and then in the resulting screen, replace the site’s name with a single period. 3.Click Add, and a black icon will be added to your Home Screen, with a pretty easily ignored period as its name. – Mac with bluetooth option. Slide two batteries into the battery compartment as shown below. Note: The aluminum Apple Wireless Keyboard (2007) uses 3 batteries. Replace the battery compartment cover and leave the keyboard turned off. Open Keyboard System Preferences by choosing System Preferences from the Apple () menu, then choosing Keyboard from the View menu. Click the ‘Setup Bluetooth Keyboard’ button in the lower right-hand corner of the Keyboard Preference pane. Turn on the keyboard. The light above the power switch should begin to flash. After 15-30 seconds, the keyboard’s name should appear in the preferences Search pane. Click Continue. The Setup Assistant will try to pair with the keyboard. When the Setup Assistant prompts you to do so, type the passkey shown in the Setup Assistant on the Apple Wireless Keyboard. Press the Return key on the keyboard when you are finished. Once the computer and keyboard have successfully paired, the Keyboard System Preferences pane will expand showing all configurable options and battery level in the lower left-hand corner. You should now be able to use your aluminum Apple Wireless Keyboard.